History: Coryphaena hippurus, or better known by its Hawaiian nomenclature, the Mahi-Mahi, is also scientifically known as the dolphinfish. The similarities of the dolphinfish and the dolphin, end in the name; the two look nothing alike. The word mahi-mahi is actually Hawaiian for “strong” and indeed, this robust fish’s stature lives up to that name: the average length for the Mahi-Mahi ranges from 3 feet to 6 feet, and typically weighs in at 30 pounds but can tip the scales to over 90 pounds. Mahi-Mahi are as beautiful as they are large. From the dorsal fin, a bright blue transitions towards a green in the middle of the body, and eventually transforms to a golden yellow at the belly. In fact, this golden yellow paved way to its Spanish name, the “dorado.” However, once the dolphinfish dies, the skin color fades to a shiny gray. The dolphinfish are known to be carnivorous, consuming anything from shrimp, baby mackarel, baby tuna, baby billfish, flying fish, crabs, squid, and jellyfish. They feed near the surface and are quick to grab their prey. 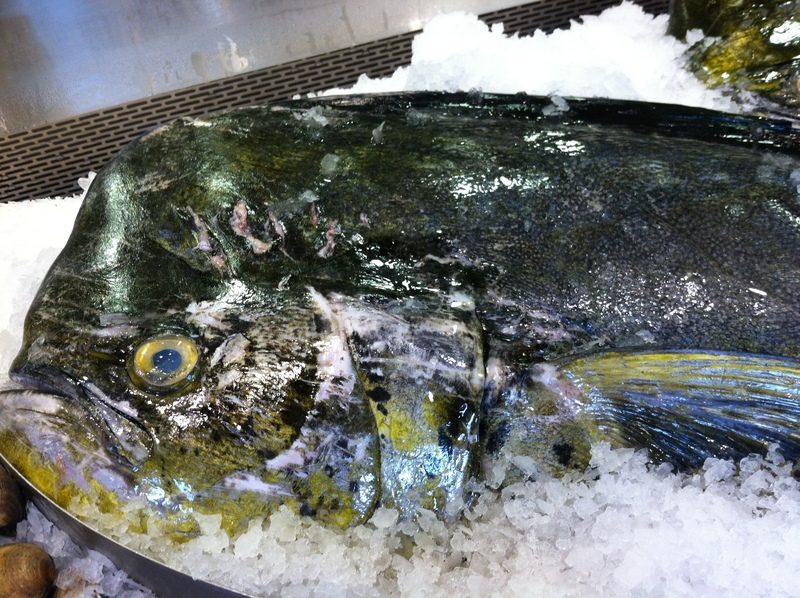 The Mahi-Mahi are fished in UN-established Food and Agricultural Organization (FAO) areas 71 and 77. This species is not listed as extinct, endangered, nor threatened by the WWF. Choosing: Unless you’re at a Wholefoods that receives the fish whole, you can only purchase filets of mahi-mahi at the local market or grocery. Even though you cannot select certain parts of the fish, you can gauge the parts by choosing the size of the fillets and hope that it is the part you think it is. 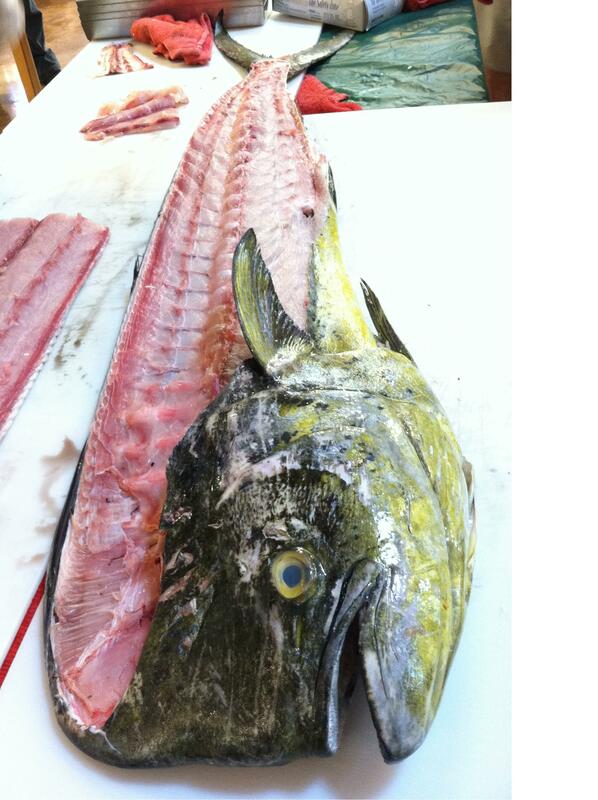 However, if you do catch a dorado, you first want to cut the dorsal fin and make an incision near the head. Pinpoint the knife where the meat meets the spine of the fish and start slicing towards the tail. Make sure that when you’re slicing, that you keep the knife blade as close as possible to the bones of the spine. You’re left with what you see below. Depending on the cut, the coloration ranges from light pinkish-white to pinkish-red. 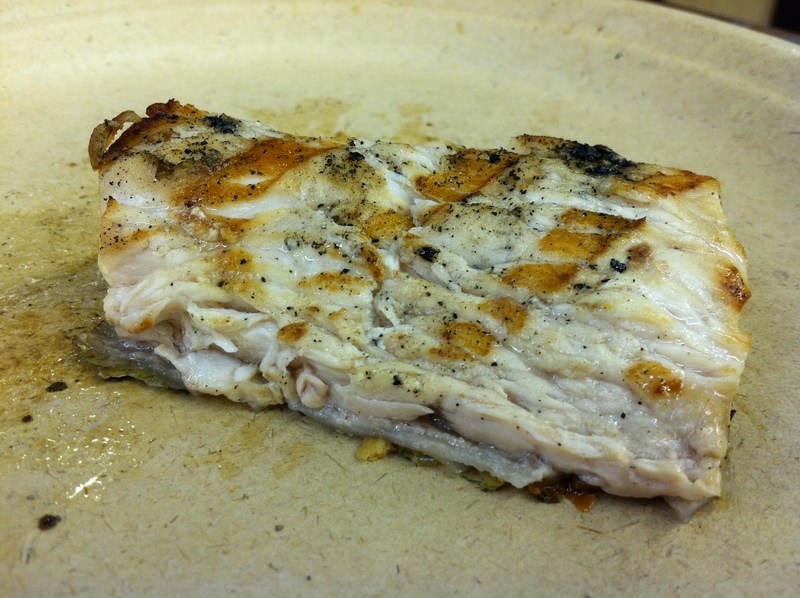 The mahi mahi shown was broiled, then thrown on the grill for a quick char. 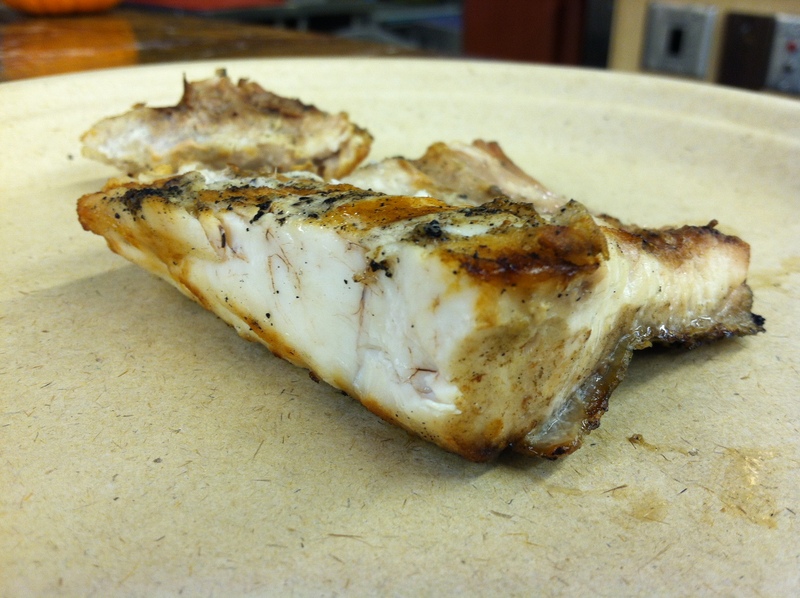 Notice how like most fishes, the finished meat is white. 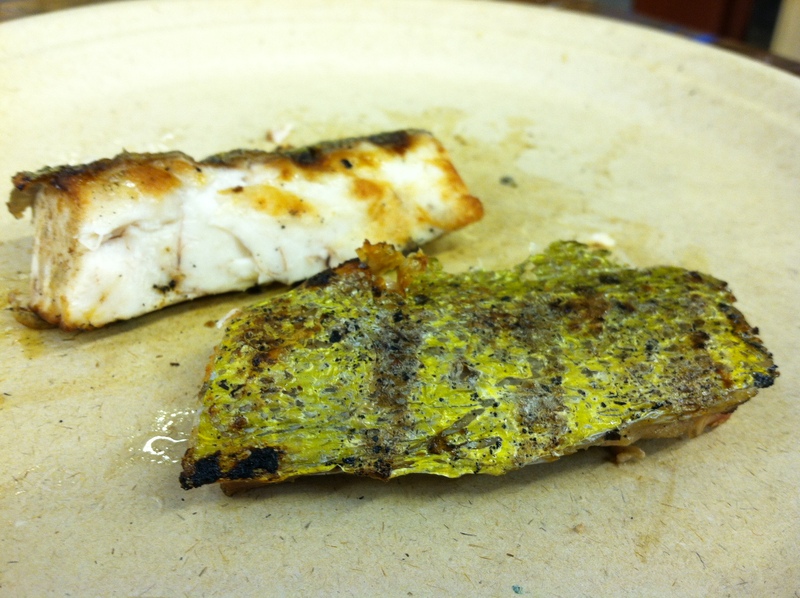 I ate the mahi-mahi with the skin left on, which as you’ll notice still retains the signature golden yellow of the belly. The skin is not too thick, but I recommend that if you do eat it with the skin that you de-scale it properly. Skin-on fillet provides a great contrast in texture because the crispiness yielded through grilling pairs well with the flesh. 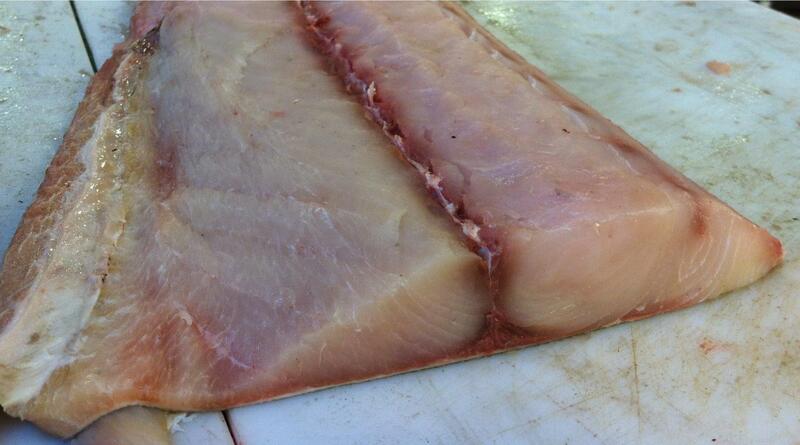 Mahi-mahi meat tends to be firm and a bit on the dry side like tuna but not as hardy as swordfish. For those that want a more succulent and juicy cut. Purchase the belly portion. Evident here, the omega 3 oils are leaking out. The meat formation is also different below, as you’ll notice each section where the meat breaks, is a lot thinner and smaller than shown in the filet above. 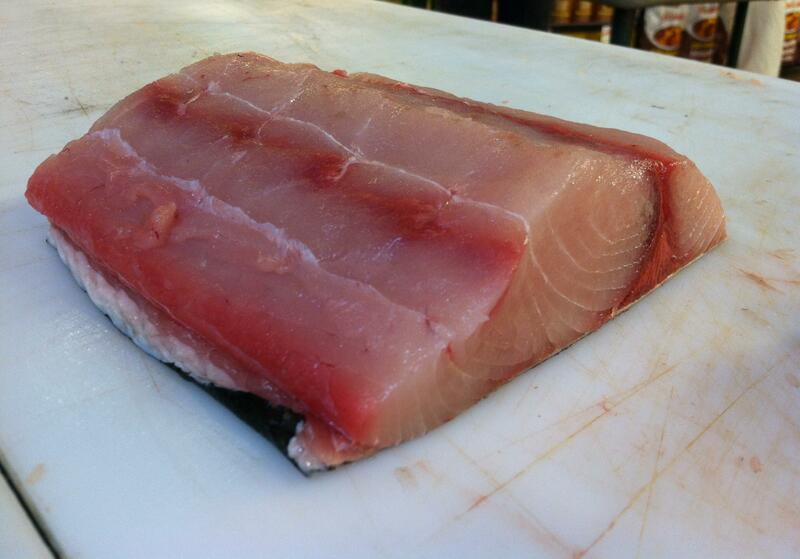 Have you had mahi mahi before? 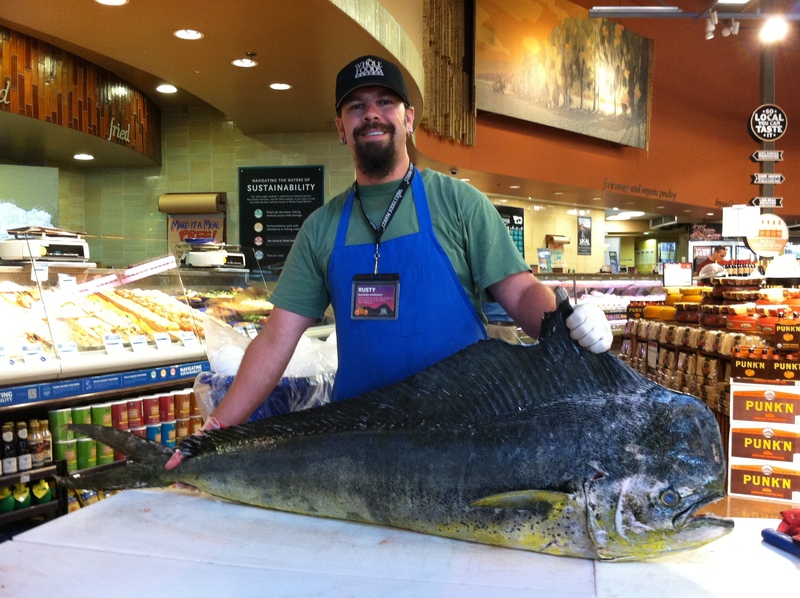 What is your favorite recipe to use for the dolphinfish? Very helpful, thank you. I love the Mayo Clinic Cookbook recipe of Mahi-Mahi with macadamia nut crust.